where D is the euclidean distance from the cell to the nearest cell in the network, and δj is the coefficient expressing the importance of accessibility for the desirability of the cell for land activity j; aj is then inserted as a coefficient in equation 2 (see above). This gives a reasonably dispersed distance effect with a halving distance of 2.5km. Works fine. 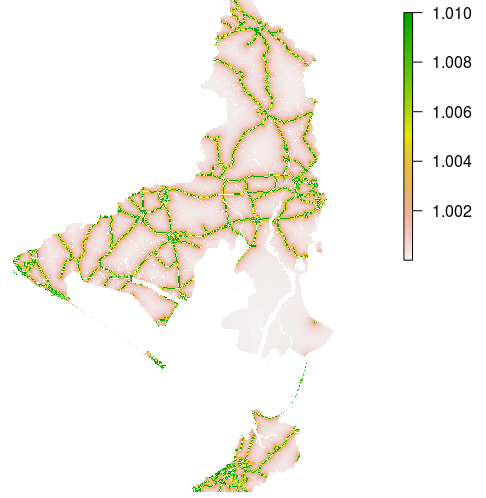 Note that areas where roads already exist (distance 0) take unmeasurably large values, (Inf) (and therefore appear white). This should be no particular problem, it will just mean that all urban cells will try to sit on top of roads. Since roads are not explicitly modelled, this isn’t a problem. Thus every cell which had a value greater than 2 gets a value of 2.
model_accessibility <- accessibility #change the name to match the others we will use for the Transition Potential computation.